What is appreciative inquiry and how do you get it to work for you? Appreciative inquiry explores at what is possible and what is right rather than what is wrong. Appreciative inquiry helps us explore what is working well and what we want more of while keeping our business environment feeling positive and supported. How do we get the highest satisfaction (from employees and from clients)? Where do we make the greatest ROI? What if we cut client attrition by 50%? By focusing appreciative inquiry questions on how to expand our world of good, problems are left behind – not because we ignore them but because they lose energy. Problems are solved because most become irrelevant in our pursuit of what we do best. One of the core pillars is that what people focus on has the highest natural chance of becoming real. Therefore, by exploring an issue from a position of ability, you and I automatically create an environment where people throughout the organization ‘feel‘ trust and empowerment, where work is valued, where employees are proud and where all opinions matter. Consider the reverse: How would everyone ‘feel’ after a team spent one or two days identifying what everyone does that hurts the company? Another benefit of appreciative inquiry is that at the end of the investigation process, all that time has reinforced positive behaviour – behaviour we want to see more of. This is fantastic because it speeds up the solution implementation process. Consider the alternative: if all that time was spent exploring problems, at the end of the exploration phase all we’d be left with is ‘What is bad’. Not only is that demoralizing, there is no clear idea what we should be doing… and now we also have to rebuild employee pride and confidence. Ugh…. Where Can We Use Appreciative Inquiry? When I was working in the Corporate Marketing Department at Scotiabank I fell in admiration of Behavioural Event Interview (BEI), because it helped me hire the right staff by uncovering the best in people through stories of their accomplishments. In the last 5+ years I’ve fell in admiration for appreciative inquiry because it also uncovers the best through stories and more specifically, positive stories. Appreciative Inquiry was developed by David Cooperrider and Suresh Srivastva at Case Western Reserve University in 1987. Investing in a High Performance Team can consistently provide exceptional gains in productivity, increase product / service quality, lower costs, achieve faster time to market as well as improve individual job satisfaction. WOW! Sign-Me-Up! After a century of cutbacks, more and more organizations are looking to empower their employees and encourage collaboration to increase revenues and ROI… and High Performance Teams are an answer. Members of High Performance Teams must also be committed to each other’s personal and professional growth. This combination can result in exceptionally high team performance and ROI for the organization. This combination also holds High Performance Teams together during inevitable setbacks. And while this sounds logical and largely desirable, building a High Performance Team is difficult to accomplish. Telling employees they need to collaborate does not make them a team, especially a High Performance Team. The reality is that most work environments support an atmosphere where co-workers (and even team members), compete for reward and recognition. This may provide short-term results, however in the long-term employee competition is disruptive to employee morale and success of the company. The success of a High Performance Team is empowered by the support of the team leader and their ever vigilant, positive focus. Leadership serves the High Performance Team by aligning the diverse personal talents of team players and organizational resources to the goal. A team lead must build team confidence in each members ability to contribute meaningfully and to replace undesirable behaviour (like competition), with trust, cooperation and opportunity. A team lead must also ensure the team and team members are properly supported. Support may mean removing obstacles like newly imposed budget restrictions, accessing training (growth), or perhaps securing technology that will provide a competitive advantage. Measuring success and encouraging the individual and the team when performance doesn’t meet expectations is also a Team Lead responsibility. In contrast to the performance measurement most of us experience, performance measurement within a High Performance Team is constructive. High Performance Teams learn to communicate in a positive, efficient and predictable way. They use face-to-face meetings to share ideas (again using AI principals), and email when it is appropriate (to confirm decisions and share information). They are mindful and respectful to each member’s needs and feelings and are equally open to share their needs and feelings. Being part of a high performance team and understanding its goals increases personal commitment and quality. One of the many wonderful outcomes is that problem solving becomes a creative rewarding opportunity rather than a negative experience (which often demotivates the team and hinders creative thinking / solutions). Not every person will have the required skills to be part of every High Performance Team. That doesn’t mean they are not good team players – it may only mean they are not right for a specific High Performance Team. 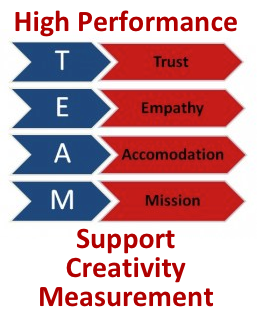 Investing in the development of High Performance Team’s (goals, trust, skills, communication and attitudes), can provide your organization record gains in productivity, product / service quality, lower costs, and faster time to market. 1. Appreciative Inquiry (sometimes shortened to “AI”) is powerful discovery technique that empowers a situation by exploring what is positive or what an organization does well rather than on what is undesirable.